In 1996, the Unabomber suspect, Ted Kaczynski, was arrested. TWA Flight 800 crashed off the coast of Long Island, New York. Bill Clinton was elected president of the United States. The movie Jerry Maguire hit the silver screen. “Macarena” was the hottest song. And some of you were probably born. For Danny Sullivan, 1996 was the year he published research called A Webmaster’s Guide to Search Engines. Wait. You mean there were search engines before Google? Indeed. Danny has been in the industry for more than 20 years, and he is arguably one of the smartest people on the planet when it comes to SEO, which is why we booked him to speak at this year’s Authority Rainmaker event. After publishing A Webmaster’s Guide to Search Engines, Danny founded the website Search Engine Watch, which eventually became “must reading” (according to Google’s Matt Cutts) and “the most authoritative source on search” (according to Tim Mayer of Yahoo!). Sullivan eventually sold Search Engine Watch to Jupiter Media and stayed with the company until November 2006. The Seth Godin of search? After leaving Search Engine Watch, he started Search Engine Land, which he runs to this day. He also serves as Chief Content Officer for Third Door Media, which publishes Search Engine Land and produces the SMX: Search Marketing Expo conference series. When it comes to search, Danny is overshadowed by only one other person: Matt Cutts. And the case could be made that Danny is actually more visible, since Matt took an indefinite leave from Google. So I’m going to go on record as saying that Mr. Sullivan is the Seth Godin of search. It’s an understatement to say Danny has got his fingers on the pulse of search. He’s a crazy prolific author, on top of the latest developments within minutes of the stories breaking. It helps that he’s on a first-name basis with the big players in search. So, if you’ve ever wondered how a crack journalist lives and works (particularly in Southern California), then take a peek inside Danny’s Writer File. And did I mention he works on a treadmill, too? Yeah, what doesn’t Danny do? Thanks for sharing with The Writer Files, Danny! I’m Danny Sullivan, and I’m a journalist who covers the digital and search marketing space. I’m especially known for my writing about search, which I’ve done for nearly 20 years now. But my expertise is really trying to take technical subjects and break them down into easy-to-understand explanatory journalism. I primarily write on MarketingLand.com and SearchEngineLand.com. I probably read about four hours per day. It can vary, and that’s a guess. I’ve never thought to add it up. But I read a lot. How many hours each day do you spend writing (excluding email, social media, etc.)? What is your most productive time of day? It can vary. On a typical day, if I’m not doing special projects, anywhere from an hour to three. My most productive time tends to be late afternoon. By then, the email is dealt with and nothing new tends to break. My most productive time is actually late at night when no one else is working, but I don’t like to work nights. I write when I need to, in terms of breaking stories, or when I do longer pieces as time allows. I do. I tend to avoid it by just diving in. I don’t have time to waste on writer’s block! Building universes out of nothing. John Scalzi, Peter F. Hamilton, and Ann Leckie are just a few of my favorite science fiction writers. I read a lot of science fiction. I’m terrible. I don’t have a best loved quote. I’d love to be a creative writer, a fiction writer. It would also be nice to finally write a book. I don’t have a muse. I actually wrote a post on Medium called The Voices Of Inspiration, where I bemoaned that I don’t hear the muse or characters or stories the way fiction writers are inspired. It’s depressing, because I’d love to be that way. But for nonfiction, I can just have a story fall together in my head, the words flowing in. So if there’s a writing muse we tap into, maybe I’m hearing it, just for a different type of writing. You tell great stories that people are compelled to read. MacBook Pro. I use multiple monitors, so I can compose on one screen, read if I’m referencing something on another, and test on a third. I do stick to deadlines. If work needs to be done by a certain time, I do everything to make it happen. If you can’t, then push it back to a reasonable deadline. My biggest problem is sometimes I just don’t want to do one of several things I need to do. In that case, “do anything” is my mantra. Even if I’m not working on the most pressing thing, doing another task means at least something is getting done. My calendar is my to-do list, with key things that need to be done posted to it. That’s pretty much it. Turn off the computer, play some Clash Of Clans, read a book, have a drink on the patio with my wife, spend time with my boys. My high school English teacher emphasized the importance of critical thinking. He always comes to mind among my most important teachers. My children and ensuring they’re taken care of and happy. What’s your biggest aggravation at the moment (writing-related or otherwise)? Sometimes I feel overwhelmed by clickbait, that it takes too much attention away from serious issues. But then you get serious issues that tap into clickbait to attract attention, and then I feel like everyone shares these concerns but no one does anything to fix these issues. I would literally freeze up talking with any of my favorite authors — I’d just get too shy. Actually, it would be pretty cool to have dinner with Shakespeare. I’ve been to Tahiti years ago. That would be nice. Or Hawaii. Though frankly, I still love home in Southern California. I sometimes think that I should have gone to a different college for a career in journalism. But it has worked out great, so my takeaway is: don’t spend so much time thinking about what you’d do over and focus instead on where you want to go and how to get there now. Twitter is a great way, @dannysullivan. Every serious writer builds a shrine of some sort with which he hopes to entertain the Muse, whether that means sitting underneath an umbrella on a beach in a foreign country or parking it in a small shed out in the backyard. Danny’s desk just happens to be on a treadmill — with three big, beautiful screens staring back at him. It’s in his house, so the commute is short, which is fortunate given the fact he will walk anywhere from four to seven hours in one day. Gives sweating a deadline new meaning. 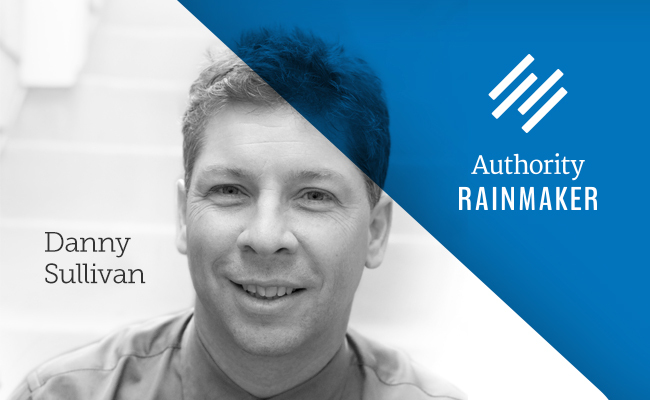 Danny Sullivan is among the powerhouse lineup of speakers who will be presenting at Authority Rainmaker May 13–15, 2015 in Denver, Colorado. Accelerate your business with integrated content, search, and social media marketing (plus invaluable networking). Previous article: Scott Stratten Versus Ryan Deiss at Authority Rainmaker: Who’ll Be Left Standing?